We’ve been practicing free-ranging with some of the girls and they’re really doing a great job. I stopped trying to catch them to bring them out of the pen and for the past several nights have been leaving the door open and leaving a trail of scratch on the ground for them to follow until they are out in the work area. It took two nights of scratch bribery…I mean…ENCOURAGEMENT and Opal had it all figured out. Last night she was standing at the door of the pen waiting and making impatient little noises to go out to search for bugs after the recent rain. I opened the door and she and Mary, one of the Wyandottes, toodled right into the work area and I swung the gate closed behind them. They jumped up on the straw bale in the work area and because it’s still neatly bound with twine, they decided that they needed to scratch it apart with their feet. They didn’t have much luck and when the straw REALLY started flying, I kicked their fluffy little butts outside so that they could get down to business in the grass. Once they realized that they had access to the grass, I didn’t have to do much more encouraging and they were tail up and beak down sucking up bugs and tasty things in the grass. I’d like to bring the whole flock out, but some of them are such space-cadets. Particularly Roseanna, who seems to run on some sort of chicken-rocket-fuel. She rarely walks anywhere. Everything is done full-tilt-out-of-control-top-speed. I’m just too old to chase that around the yard. She’s a killer chicken. I’ll most certainly be found face-down in a pile of dog poop that Tom and Greg forgot to pick up after I chase her roughly 30 feet. That’s no way to die…face down in Labrador Retriever poop! So I make her stay inside. She’s insane. Really. Tom thinks she’s schizophrenic. I’m not a chicken psychiatrist, but I tend to agree. The lights are on, someone’s home…but you really don’t want to meet them. It’s that kind of situation. Opal is usually my free-ranging buddy because she’s sweet and docile, sort of knows her name (when she wants to listen), and she follows me everywhere. I started with her first and then added another pullet, different each time we go out, so that they can learn from her. It seems to be working. The rest of the Beaked Freaks who watch from the run, are totally upset with this whole idea. First, because they ALL think they should get to go and second because Vinnie and Cluck think I’m stealing their women. I tried to explain to them that I don’t play for the “other team” especially if that team is made up of chickens. They don’t listen. You know, hormones, have to protect the flock, blah-blah-blah. The amount of whining and complaining they do while they stand at the end of the run is just ridiculous. If chickens could write, I’m sure there’d be picketing. Last night, I started them out near the run because they’d walked out on their own. Opal was furiously eating things in the grass and scratching for things right next to the fence. Cluck came over and put his head near hers (he was still in the run) and clucked to her very, very deep and low. She responded with a few noises. Cluck ruffled his feathers and smoothed them back down and calmly walked away. He seemed to have gotten his answer that she was all right. Vinnie was just standing around. As usual. He was definitely wound-up because…well, it was probably because they were getting green snacks and he wasn’t. He was suddenly at the side of the run clucking and bawking in deep sonorous tones. Greg picked Mary up and Vinnie kept clucking in that deep, frantic way. We were impressed. Very roostery…considering it was Vinnie. 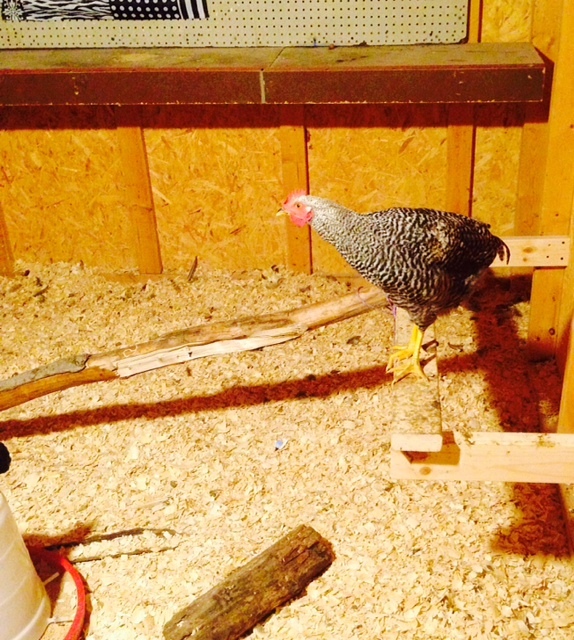 We quickly put a spiral leg band on Mary and Greg put her in the pen. While he was inside, the others came rampaging into the coop. Cluck went to the feeder. Greg (while humming the music from “JAWS”) followed Nina around slowly until she stopped to scratch in the shavings and then he reached down and scooped her up. She clucked wildly. And then…Vinnie lunged at Greg. He didn’t hurt him…didn’t peck him…didn’t go at him feet first. He just…lunged at him. We were dumbfounded…and then a little impressed! That’s what a brave rooster does! But WAIT…he’s not supposed to do it at US. We finished banding Nina and Greg set her down and then he went to get Vinnie. We’re all for being a protective rooster until you lunge at “THE PEOPLE”. Greg followed him around singing the “JAWS” theme again…dun-duh…dun-duh…dun-duh…and when he had Vinnie within reach, he snatched him up and tucked him under his arms and held his legs together. Vinnie, knowing he was busted, changed his attitude a little. Cluck, who was still eating, didn’t even look up. Greg walked around with Vinnie under his arm and gave him the “You-Need-To-Be-A-Nice-Chicken” speech. Vinnie let himself be carried around and Greg finally set him down and he walked away like nothing had happened. I put their beak on the back of their head. Suffice it to say, it didn’t turn out well for Vinnie. I think I need to have “The Talk” with him again and explain that he’s supposed to go for the GIRLS. Although, I think Cluck may have made that point this morning. I made the decision that the Beakheads should learn to free-range. Actually, there’s not that much learning involved with walking around the yard eating bugs and delicious green things. They have that part down. The real problem is getting them OUT of the coop to said free-ranging area without causing a chicken heart attack or a human heart attack because I’m the one chasing them around. So I had this brilliant idea a couple of nights ago. Instead of trying to catch one of them, I would lure them out the door by leaving a trail of scratch for them to follow. I went into their area in the coop (they were all out in the run) and stood around with the bucket of scratch and then “accidentally” threw some into the shavings…and it made that sound that grain makes when it hits the floor. I didn’t have to wait more than a few seconds and half a dozen chickens showed up at the door to the run. I dropped a little more and started backing out of the gate, talking sweet chicken talk. They followed the trail of scratch and pretty soon they were standing in the work area. I had managed to only corral two out of the original half-dozen that had come in and that was just fine. I wasn’t ready to manage TOO many of them out in the yard, by myself. Before I try that, I’ll need a box of wine and a large butterfly net because you KNOW they won’t listen to me once they’re out there. Anyway, I had Ruth and Opal. I scooped up Opal, and Ruth followed me because…well, she had no idea what else to do. Cluck was frantically walking back and forth looking for his women! 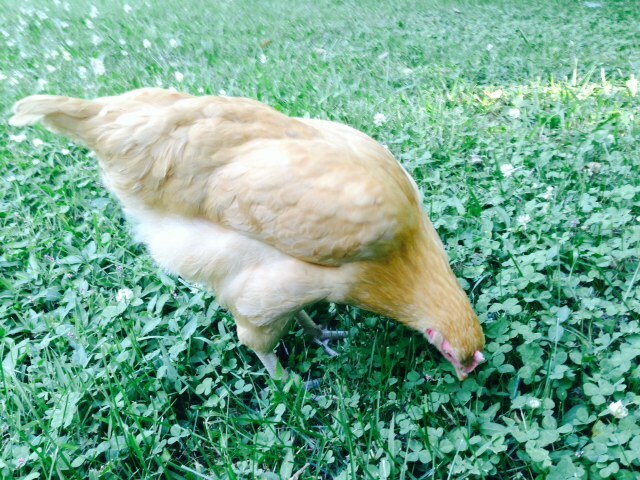 I plopped Opal down in a patch of white clover and Ruth started maniacally eating clover not far away. They were very well behaved…and adorable…but what was going on in the run was sort of embarrassing because the rest of the flock was FREAKING OUT. Cluck was frantically running back and forth at the end of the run because I’d taken not ONE, but TWO of his women. He was out of his tiny mind. To make matters worse, the rest of the girls were carrying on something awful because they could SEE Opal and Ruth, but couldn’t get to them. There was a lot of hurling themselves against the fence and attempts to fly out of the run which of COURSE didn’t work because the run has a top on it. Vinnie was out of his mind because he was missing a snack. I let the girls forage around for a little while and they eventually foraged their way back to the run and stood there making chicken noises at the flock that was still inside. I finally herded them back into the coop and put them back in the pen where they were MOBBED by the other chickens. Apparently, they are now Free-Range Celebrities or something. I filled the feeder and he flailed around and generally made a complete idiot of himself. The chickens IN the pen watched him completely melt-down with mild interest, but none of them panicked. I finally opened the door to the pen and he STREAKED inside like he was rocket-propelled. The others gathered around and clucked excitedly. Except for Vinnie…who was waiting near where the feeder usually sits, because…you know….FRESH FEED. I put the feeder back in place and they absolutely love the new organic, non-GMO feed (<–that’s the feed link) that I got for them and pretty soon most of them were beak down in the feeder digging for sunflower seeds that are in the feed. Vinnie looked up at me to see if I had anything else delicious and his wattles were COVERED with feed dust. He didn’t care. Just stuck his head back in the feeder. Cluck was still trying to get a hold of himself after being on the wrong side of the fence. I told him, that if he’s ever going to get anywhere with the ladies, he has to at least TRY to be brave. He ruffled his feathers and shook them, like he was trying to shake off the terror of the entire event and then jumped up on a roost to watch the others. I don’t think Cluck will be free-ranging with the others any time soon since it causes him that much anxiety. I told him that he’s got to toughen up otherwise, Vinnie would attempt an overthrow of the GOP. I know Vinnie wouldn’t do that…unless there was a major pile of treats involved…and then he’d only want to be in charge until the treats were gone. I don’t think Cluck is worried about Vinnie staging a coup attempt. I think he’s worried he’ll have a heart attack and Vinnie will end up in charge by default. And that won’t be good at ALL. Sometimes, the chickens do things that make me sad. Don’t get me wrong, I love them to bits. The situation with Roseanna has not gotten any better though. I have to agree with them, she’s a complete weirdo. She just has no manners. She steps on other flock members, knocks them over when she comes rampaging through the group and is just generally….well…WEIRD. The flock has just had it with her. They peck her when she tries to join them. She hasn’t been injured yet, but I’m going to have to figure out what to do with this situation. At this point, she’s become an outcast and spends most of her time by herself, which she doesn’t seem to mind. Last night, everyone was in The Dust Bowl preening and she sat alone in a pile of twigs just watching. It broke my heart a little bit. It’s ridiculously hot here today….AGAIN. I’d planned on going to a local farmers market but one of my spies on the scene contacted me and said that it’s packed and it’s HOT. I’m not good in public on a nice day. I just don’t like crowds. So, I think we’ll make the trip to another AIR-CONDITIONED market that a local orchard runs. It’s actually a store…which is better for me and no one will get stabbed if they get in my way because I won’t be hot and sweaty. I’m only thinking of people’s safety. The flock has been a bit cranky too. Cluck has been stalking Vinnie and I’m not sure why other than Vinnie is another boy. Last night, Vinnie was minding his own goofy business when all of a sudden Cluck freaked out and threatened him with the whole ruffled hackle feathers routine. Vinnie responded by ruffling his hackle feathers for a split second and then ran like a scared little girl. Cluck took off after him and Vinnie ran faster and so did Cluck. Pretty soon, Vinnie ran over to the fence where I was sitting on my chair and looked at me frantically. Cluck glided up behind him and by this time Vinnie had made himself very tall and skinny and looked as though he might just pass out right there. 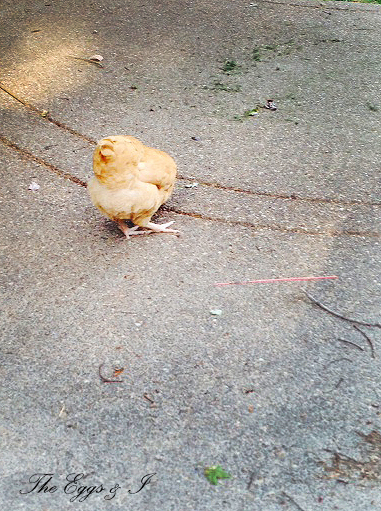 I got very close to the fence…just out of Cluck’s pecking distance and whispered..”Cluck, honey” and then yelled “KNOCK IT OFF”…and Cluck blinked at me a few times and turned and walked away. Vinnie was still all tall and skinny and I tried to calm him down by stroking his chest feathers and finally he stopped his frantic clucking and got back to his previous business of just chickening around. AND, one of the Wyandotte sisters has become obsessed with the other chickens’ feathers. If she sees a feather out-of-place on one of the other birds, she feels that it’s her important responsibility to remove the out-of-place feather. She thinks she’s the aesthetician of the flock. I think she’s a budding feather picker and she better stop it or I’m going to put her beak on the back of her head. She and I have talked and she’s considering her options. In other news, the plants on the deck are doing wonderfully! I don’t want to talk about the garden. Really. Topic is completely off-limits. I’m pretty sure that those tomatoes from the farm market we go to will be DELICIOUS. So, the southern Indiana heat continues and just for fun, it’s mixed with about 500 percent humidity. If you go outside and just stand still, you will need a towel to dry off in about a minute and a half. If you have hair, just figure it’s not going to do what you want it to, so you might as well wear a hat, put it in a pony tail or shellac it to your head…which is what I did this morning with about half a can of AIR TIGHT hairspray. The chickens are OVER it. Last night, when I went to the coop after work, they were all standing around panting, which is what chickens do when they’re hot because they can’t sweat. We provided them with as much “coolness” as we could yesterday by placing frozen water bottles around their environment, feeding cold and frozen treats and I even made them a little wading pool out of a cat litter pan and threw a bottle of frozen water in that. A few came over to check out the wading pool with the frozen water bottle in it, but since it was a new thing, they didn’t happily jump in to cool their scaly toes, but sort of just walked around it and clucked to themselves. I tried to coax Vinnie into the wading pool since he’s usually the first one to try new things, but…you know, it’s VINNIE we’re talking about here and the best that I was able to get him to do was to perch on the side of the pan and drink out of it like one of those birds from the seventies. I went out to the coop several times to check on them last night, trying to figure out other ways that I could help them to cool off. They seem to like lying next to the coop building where the air comes out from underneath the coop. That’s Cluck’s favorite hang out and on hot days, he’s usually hanging out there (panting) with a couple of his ladies (also panting). During another chicken check, I found several of them lying in the dust bath. I think Vinnie had been partially buried in sand and dirt because when he heard me on the path, he popped up very quickly like he was mounted on some sort of springs and a giant cloud of sand and dirt exploded into the air. He came skittering over to the side of the run looking for treats (even though they’d just devoured a quarter of a cold melon) and he stood there panting. Poor guy! I spent most of the evening (in between chicken temperature checks) trying to figure out what else I could do to try to cool them off. This by far is not the hottest it gets here. This is just JUNE. It gets ridiculous in the middle of summer. Sometimes we don’t even use our pool because the water is so warm that it’s not even refreshing. It’s just DUMB that it gets that hot down here. We wait all winter for the spring and summer to arrive and then when it does, you’re afraid to step foot out the door without an asbestos suit. I’ve also got to find a way to have one of the coop doors open at night and I’ve been ranting to Tom about building this massive screen door thing out of wood and hardware cloth. There are windows in the coop and a fan, but once I close those big main doors, although the fan moves air from the outside through the window, it still gets mighty toasty in there. This morning when I opened the doors of the coop, I half expected to see golden brown rotisserie chickens on the roosts. Worrying about the heat and humidity kept me up fairly late last night, but I was up and out to the coop early to spray down the run and refill the watering stations. I also threw a couple of handfuls hackberry leaves into the wading pool to hopefully entice them to get in to get the leaves out because they are their FAVORITE thing to eat these days. Vinnie saw me picking leaves and was just out of his mind with excitement. He purred and rumbled and clucked while I finished picking leaves and then I walked over and tossed them into the wading pool. He ran over and looked at the leaves in the water and tried to catch one and got a beak full of water instead. He clucked several times and tried again…same thing…beak full of water. He was joined by several others and they all tried catching floating hackberry leaves with varying degrees of success. Most of them just ended up taking drinks of water as the hackberry leaves floated out of their reach. Tom called a bit ago and said that some of them must have gotten into the wading pan because most of the hackberry leaves were gone and the gravel all around the pan was wet from splashing. YES!!! Now, if I can keep them from drowning themselves I’ll be in good shape. So, Tom is out shopping for various cooling devices as I type this…misters, outdoor big fans, etc. I told him that if it gets too hot, I’m herding the whole mess of them into the air-conditioned three car garage that he uses as his shop. They can be his “helpers”! I’m pretty sure the thought of 10 sweaty chickens hanging out in his shop and perching on his table saw is what sent him shopping first thing this morning. 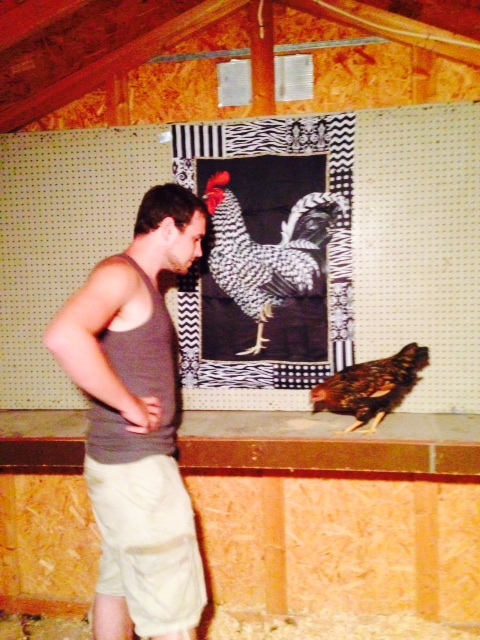 He’ll fix it up so that they have the coolest coop and run in Indiana. There’s a method to my madness (wink). The chickens are pretty much over standing out in the rain. I think at first it was novel and there was a lot of feather poofing, ruffling and shaking before they finally decided that they didn’t like getting wet and scooted into the run. Now, if the sky threatens rain, they stomp off to the coop before the first drop hits the dirt in the run. Which makes me feel better since soggy chickens make me think I need to buy them a blow dryer. As the storm came through last night, I didn’t worry about them too much because I knew they were safely in their coop with the big barn doors closed and the rain was coming straight down so I didn’t worry about the run door still being open. I knew their distaste for wet feathers would keep them inside the coop where it was dry. I waited until there was a slight break in the rain, threw on my coop shoes and scuttled out to the coop and of course it started to rain HARDER when I was about half way there. As I approached the coop, I could here the familiar clucking that I’ve come to associate with the chickens when they are happy and content. I struggled with the lock on the door…getting wetter while I did…and finally slipped into the dim light of the coop which smells a little chickenish because of the dampness, but the aroma of fresh shavings still hangs in the air. The birds were climbing on perches, eating some dinner, exploring corners of the coop and scratching around in the shavings. Dry, content, and busy. Perfect! I plopped down on the straw bale outside of their area to talk to them and several came over to check for treats. I displayed my open hands and spoke to each of them, stroking their soft feathers through the wire fencing. I didn’t want to invade their space last night. I just wanted to watch them for a bit. Not finding my hands full of treats, they endured my petting for a bit and then went back about their business…I can never figure out what business chickens are busy with…but they seem to know, so I just let them go with it. During my coop decorating frenzy this weekend, I added a mirror that we found on sale at a local store. Tom liked it because it hung from a rope. I liked it because it was a mirror. 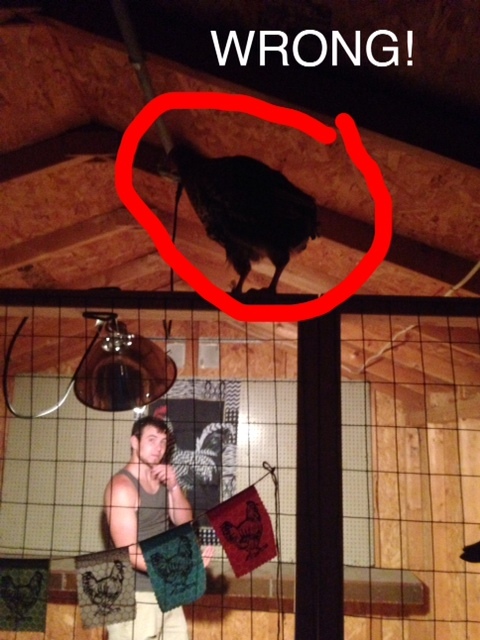 The chickens were terrified of it when I hung it in the coop. They got over it pretty quickly and then it seemed as though they just ignored it. Which is fine…ingrates. Where I was sitting was just outside of where the mirror hangs and I wasn’t really paying attention to the mirror, because Vinnie was still campaigning for some sort of treat and I was explaining to him that he is really a vulture. I happened to notice movement by the mirror and watched as Opal, our sweet Buff Orpington, gazed at her reflection for a long moment. She cocked her head, still looking at the mirror and made a soft clucking sound and watched as her reflection did the same. Soon, she was joined by one of the Wyandotte Sisters and they both watched their reflections until Vinnie stampeded through and ruined the moment. I am always concerned with providing a stimulating environment for the flock. I think that every living being that is able to possess curiosity, leads a much fuller life because life is then filled with discovery and wonder. 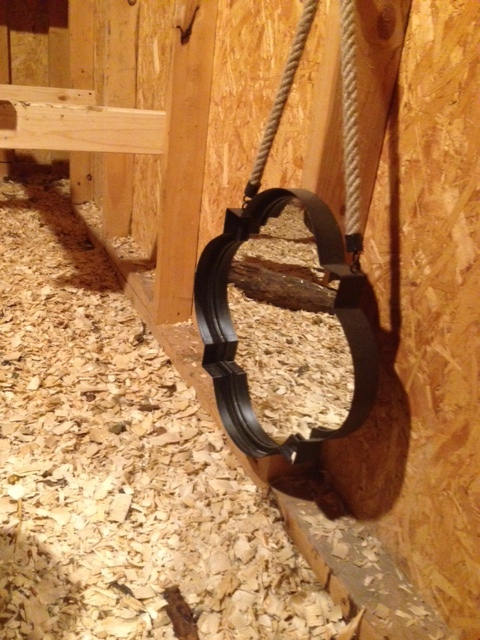 Adding a mirror to the coop was definitely a good idea. I’d rather see them out playing in the run and doing their chicken act outside, but on days like this where the rain makes the run an unpleasant place to be, I’m glad to see that they’re still finding things that interest them due to their natural curiosity. I think I’m going to look for more “enrichment” ideas for their coop. If I change them up occasionally, the ideas will stay fresh and I’ll be able to see what their favorites are. I have a whole list of ideas of things that they might find curious but are still safe for them to explore. I can’t wait to try them out! You can be sure I’ll let you know how it goes. When I first got my chickens, I was determined to do the very best for them. So I did the wrong thing and read EVERYTHING I could find on the internet. Don’t get me wrong. I love, love, love the internet. When you want a definitive answer about something though, and you’re new to whatever you’re researching, it can be very confusing because you find so many differing opinions and bits of advice. We talked about bedding, or as some call it “litter”, for the coop a lot. First I told my husband I wanted shavings…I read some more online and I said I wanted sand…then I read some more and I wanted a combination, then I wanted straw, then I wanted straw and shavings and then my husband wanted me to quit changing my mind. We’d been using pine shavings that we’d purchased at the farm supply store as brooder bedding and we had a fair amount left. I didn’t want to be wasteful, so out of that reason came the decision to try shavings in the coop. In the past, I’ve had shown horses and we always used shavings in the stalls. It was a little dusty when we dumped in the wheelbarrow of shavings, but after a couple of hours, the dust settled and it didn’t make for a terribly dusty experience. Farm animals are a dusty bunch, so I expected dust with whatever I used. Our horses had loved rolling in fresh shavings and I loved burying my nose in their mane and inhaling a deep breath of fresh shavings smell combined with the sweet smell of horse. The shavings were absorbent and the barn always seemed to smell like hay and fresh-cut lumber. Not a bad combo at all. We priced straw and found that we’d pay $7 a bale for it in our area and very few people seemed to be selling it. We purchased a bale during my “straw phase” and when we broke it open, we found that the interior was full of black mold. I didn’t want to have to break open every bale of straw before I bought it to inspect for mold and I knew mold was bad for chickens. Suffice it to say we never spread that moldy straw in our coop and instead used it to cover some new grass seed that was nowhere near our flock. I looked at sand too. I hate walking on sand. I’m sure chickens don’t, but because sand has the tendency to “give” when you’re trying to walk, it makes it difficult to walk around in the area where the chickens are kept. The advice was to use “washed construction sand”. Home improvement stores look at you like you’ve lost your mind when you ask for it. The sales person shrugged and said there was play sand in the garden area. I knew play sand was a bad choice because it was fine and dusty and if chickens happen to ingest too much of it, it can cause a crop full of sand which can get impacted and the bird could potentially die. I had read that it was great for dust bathing (I’d made them a dust bath already) and that it was easy maintenance to scoop out chicken poop that had been desiccated by the sand. I don’t even like to clean the cat box. The thought of scooping chicken poop out of sand in the large coop area didn’t appeal to me at all. It also didn’t appeal to me at all that I’d have to buy this stuff by the truckload and have it delivered and then haul it into the coop, push it around to smooth it out and then during my complete cleaning, I’d have to shovel the darn stuff out and sand is HEAVY and I’m OLD. It also didn’t seem sanitary to me…but then again…how sanitary is any chicken bedding? I was also worried about the heat and cold and the use of sand. I want something that warms up quickly in the winter. Sand doesn’t logically seem to be something that would do that. We also live in a very humid area and like a child’s sandbox, I envisioned sand holding moisture on humid, damp days and chickens walking around with damp sand clinging to their feet. It also doesn’t seem like something that would be comfortable…although I’m not a chicken and I’m not sure what their feelings are because they’re very tight beaked about things like giving their opinions. I finally went with what I had and used shavings. We can get them for about 4.50 for a compressed package. So we covered the coop’s wooden floor with shavings using two bags to create a deep soft bed of about 3-4 inches while it’s fluffy. I always leave some of it in piles near the back and center of the coop, because the chickens spend a ridiculous amount of time scratching around in it and looking for treasures and always scratch the piles flat. It keeps them busy for a while. I didn’t want shavings out in the run, so as I spread the shavings, I made sure that there was a more shallow area of shavings right in front of the door. The chickens have to step up to go through the run door, so the shavings naturally don’t fall out the door. I also put a flagstone just inside the door on top of the shavings. The chickens always step on that stone when they are coming and going through the run door. When it’s dirty, it can be hosed off and replaced. I’ve not had any problems with shavings out in the run. Vinmaster V (he’s also a rap star) looking out over the shavings floor in the coop. He thinks they’re the bomb-diggity. I also found, that the chickens will turn the shavings daily for me and they don’t mind at all! I throw in some treats like dried meal worms and they scratch and scratch and turn the bedding over very nicely when they’re searching for their treats. Fresh shavings are brought to the top and soiled shavings gravitate to the bottom. The coop continues to smell like fresh shavings too! I do have some tracking of shavings into my work area in the front of the coop by my shoes, but it’s a snap to sweep them up with my corn broom and just toss them back in the chicken area. We discovered that with ten chickens, two bags of shavings in the coop will last between two to three weeks depending on the weather and how often the chickens can’t go out due to rain. The first time I had to change out the bedding, I was determined to do it myself because they were MY chickens and I promised my husband that I would care for them. I used a shovel and easily shoveled all of the shavings into a large trash can so that we could add it to the compost that we were creating for the garden and plants in our yard. When I’d filled the can, I groaned a little. I expected to have to get Tom or Greg to carry it around the compost pile. I tried to move it…IT WAS LIGHT!! I could do it myself! Can you imagine if I’d had to shovel sand and then try to move it to…wait…where would I have even PUT the soiled sand? Anyway, I would have been in traction for a WEEK. We’ve been using shavings since the beginning and honestly, I just love them. They smell clean, they’re easy to change out, they have very little dust once they’re spread and my happy chickens love to dig a shallow hole in them and then fluff the shavings around them with their beak like they’re creating a little nest. I have to believe that they like them when they create that little nest and settle down with their head under their wing to take a nap. If they didn’t, they’d be out sleeping in the dust and dirt in the run. Shavings seem to make their home cozy, they seem to be as healthy an option as anything else (as long as it’s not cedar shavings…do NOT use those as they can cause respiratory issues with your birds due to the toxic nature of cedar oils) and I can manage them myself without calling a quarry or trying to track down large amounts of clean, bright straw. I will be using a combination of straw and shavings in my nesting boxes and we plan to use straw bales around the perimeter of the coop during the winter for the insulation it can provide. I think bedding choice is YOUR choice. Read everything you can find, but don’t feel like you’re not doing the right thing because what you choose to do doesn’t align with what someone else has done. Educate yourself and choose what makes sense for the health and happiness of your flock…and possibly your spine. In a couple previous posts, which you can read HERE and HERE, we discovered that chickens can fly much better than we thought they could. We’d made the top of their indoor area about 4 feet tall initially. That thoroughly illustrates how new we are to chicken keeping. We just thought the little darlings would be so happy in their run that they would never even think about trying to get out of it. It never occurred to us that chickens like to roost in high places…like four foot tall places…like the top of the fence in the coop. So with this new-found information (I’m sure someone, somewhere probably had told me that the fence was too short and I didn’t listen), we decided that we’d take the walls up another three feet. My super handy hubby framed out additional height to the existing fence and we added the wire and then I smugly told the chickens that there was a new warden (me) in town. As usual, they didn’t seem to care…but it made me feel better and as soon as the entire world realizes it’s all about ME we’ll be much better off. 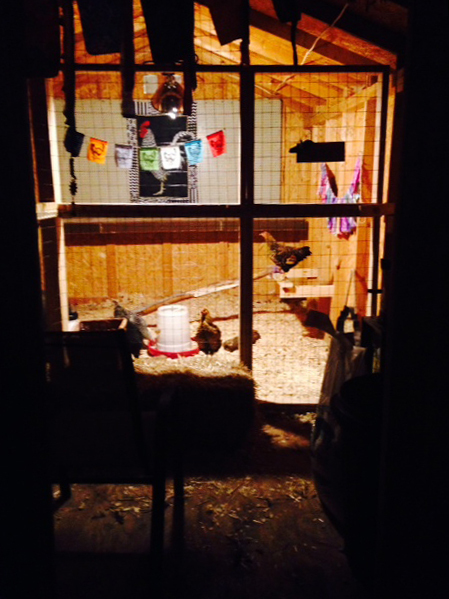 Anyway, we were in the coop one night this past week admiring all of my new and groovy decorations. I’m clearly going over the top with the whole chicken coop decor thing, but it makes me unbelievably happy to jazz up their coop with silly stuff. I keep telling my husband about things I want to add to the coop and he just shakes his head and tells me that he’s happy that I’m happy. My daughter, who is eleven, has started to just walk by me and say “YOU ARE OBSESSED”, to which I respond “YES I AM”. Sorry…little tangent there…back to the coop. Tom was sitting in the chair with his feet on the bale of straw and Greg was in the run area communing with the chickens (read as…picking them up and saying “YOU…are a nice chicken”…we try to keep their self-esteem high). One of the Gold Laced Wyandotte Sisters was standing on the roost under the new fringe bunting and we could tell that she was eyeing that seven-foot top to the fence wall. She’d get very tall and skinny, sort of evaluate the height and distance, scrunch down to prepare for take off and then she’d think better of the whole situation and jump off the roost and walk around for a while. 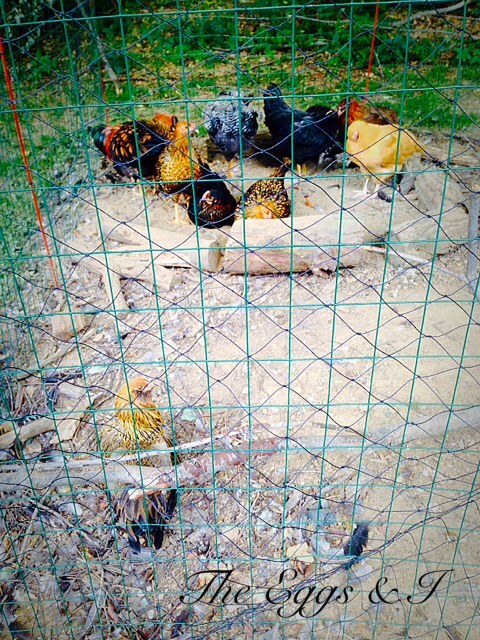 Of course, we were all sassy about it and thought that we’d foiled their plans to roost on the top of the fence. She walked around on the coop floor for a bit and we sort of lost interest in her because we were trying to convince some of the others that the cool shelf that runs all the way across the back of the coop was a GREAT place to roost. The nightly fight on the roosting bars was getting to be a little more physical than we liked. I tried to show them if they would all just SCOOT DOWN, there was plenty of room on the roosting bar for everyone, but you can’t reason with chickens. Save your strength…they just don’t listen. So Vinnie was on the shelf and fell off the shelf because he’s not very good at….well, anything. That’s when one of us glanced over at the roost near the fringed bunting again and noticed Mary, the Wyandotte, evaluating the top of the fence again. She’d scrunch down to take off, and then stand up…scrunch down…and then stand up…over and over again. We stopped watching the rest of the flock on the other roost attempt to throw each other off the roosting bar while cackling madly, and all watched Mary. The scrunching and standing continued and then she scrunched REALLY low and took off. I expected her to crash into the wire and hit the floor, but SHE MADE IT. She walked happily back and forth on the top of the seven-foot fencing, clucking merrily and looking down at the others. In a flash, Vinnie was on the roosting bar doing the scrunch and stand thing and that’s when we knew we were in trouble. Tom grabbed Mary off the top of the fencing and took her back into the chicken area and Vinnie forgot all about the top of the fence because if someone was coming into their area, they MIGHT have TREATS. He’s impossible. We decided that we needed to wrap up Chicken Bedtime early and I flipped off the lights. Chickens can’t see that well in the dark and if they can’t see the top of the fence, I figured they couldn’t fly up there. I must have figured right because the next morning, everyone was where they were supposed to be when I opened the coop…or they’re sneakier than I thought and they had all jumped down before I’d gotten there. Either way, I’m not letting them go to the prison commissary this week. Yesterday, Tom extended the wire to the CEILING. Figure that out, PRISONERS! I’ll be in the Warden’s Office…watching Orange is the New Black. I took a few days off from writing for the Memorial Day holiday. It really was a lovely weekend. Perfect weather, great food, and of course my family and chickens provided enough blog fodder for the rest of the millennium. For some reason, I’ve been on this cooking spree. Some people go on crime sprees and break into cars, I go on cooking sprees and try new recipes that call for ingredients that I don’t have and sometimes haven’t heard of, which necessitates 137 trips to several local grocery stores by Tom. He usually forgets half the supplies that I need and ends up going back at least once. He usually never grumbles about it because he, like the chickens, is motivated by food. I’m fine with that. I had found a tasty looking recipe on Pinterest for Chicken Marsala. Let’s just give a brief “HOORAY” for Pinterest, shall we? I spend most of my time there surfing around for ideas and recipes while Tom watches programs about aliens, Sasquatches, and mountain monsters. I’ll find a really great idea for something and when I’m laying on the sofa it’s really easy to think “I CAN DO THAT!! !” when in reality I’m more likely to print off the instructions and give them to Tom and say “will you make this for me?” while batting my eye lashes. In this case, when I found the Chicken Marsala recipe, Tom offered to cook it up on Saturday. So I took him up on that offer. Because I’m not THAT insane that I’m going to say “No, that’s okay” when my husband offers to make dinner. Tom went out to get mushrooms, dry sherry and sweet Marsala wine and a few other things for a dessert that I was making that involved fresh strawberries and a ridiculous amount of butter. He was gone FOREVER. He finally arrived home carrying an assortment of grocery bags and brown bags. Apparently, the Tri-State area is not really into sweet Marsala wine and he’d had to check all the grocery stores on the west side of town and a couple of liquor stores where he finally ended up finding it which is typical, it seems, for the things that I pick off of Pinterest that I think are “doable”. So he made dinner and we’ll just skip to the part where we ate it. DELICIOUS. Totally worth combing the area for Marsala wine and if they don’t have it where you live, I recommend that you move someplace that does have it because this Chicken Marsala was the absolute BOMB. I try not to eat carbohydrates, so when he served it over pasta, I just had mine without it. STILL delicious. I’ll post the recipe HERE because you really should try it. Or make your husband cook it for you…and definitely make him shop for ingredients. After dinner, we had a lot of pasta left. I remembered that CHICKENS like SPAGHETTI!! Yes, yes…I know it should be whole grain. Just pretend that it was…because it wasn’t…but it WAS plain..no sauce and no butter. Also, before you start writing your reply about what a bad chicken mom I am, I know that they shouldn’t have it very often because it’s bad for them and they’ll get fat. At the time, I was bored, I knew they’d like it and so I packed up a bowl of it and headed for the coop. The run was empty. I LOVE it when they aren’t out in the run and I bring a treat to them because I get to yell “CHICKENS!!!!! 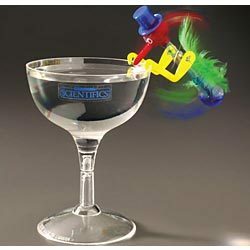 !” and they all come barreling out of the coop like they’ve been shot out of a cannon. Have you ever really watched a chicken running toward you? It KILLS ME. Vinnie is the only one in the group with school bus yellow feet and when he runs his feet and legs are REALLY noticeable and I find myself laughing at him every single time…which I’m sure isn’t good for his self-esteem, but hey…if you’ve got school bus yellow legs and feet, be prepared for a few giggles when you run. They had no idea what I had in the bowl, but I’m sure in their tiny chicken brains, there’s a picture of a bowl with a smiling chicken next to it which means “BOWL=FOOD”. They danced around in the run and pecked at my new floral Toms through the fence wire. I had to convince a couple of them that the shoes were not the treat. I threw an experimental piece of spaghetti into the run which, of course, was met with absolute hysteria because OH MY GOD SOMETHING IS FALLING FROM THE SKY!!! The pasta just laid there while they got their acts together. Finally, Vinnie, self-appointed “TRYER OF ALL NEW THINGS” came over to look at it with one eye. He decided it was treasure and grabbed it and ran off which, of course, started a game of Chicken Keep Away and it was nine against one. Vinnie raced around the run with the prized piece of pasta hanging out of his beak, a wild look in his eye and his yellow feet and legs just a blur. I let them chase him around a little, and then I threw in more pasta. Hysteria. This time, shorter lived as the others forgot about Vinnie and his treasure and were more interested in the pile of pasta on the ground. They walked around it and on it, looked at it with one eye, and pecked at it a little. Meanwhile, Vinnie had set his down and was looking at it again. He pinched off a piece and tasted it and then another piece and another and suddenly, he just gulped the whole thing down and raced back to the pile for more. He grabbed another piece and raced to the other end of the run, yellow legs flying, while he snarfed down pasta. Apparently it was “To go” pasta. The others noticed that he was EATING it and they became more interested in it and gave it a try. As soon as they finished a strand of spaghetti, they’d race back to the pile for more. I watched them for quite a while. Most entertaining thing I’d seen since the Mixed Vegetable Incident of 2014. Even Cluck Norris was scarfing down spaghetti and looking for more. Every one of them was happily clucking and eating and wiping their beaks on logs. Vinnie wasn’t worried about wiping his beak at ALL and would run up to one of them that was working on a piece of pasta and try to swipe it. He was completely obsessed. He didn’t know whether to steal someone’s, go get his own, or scratch in the dust to make sure that none had been dropped. So he tried all three simultaneously. Which lead to me going to get a chair to sit in because I was laughing so hard. The pasta was finally consumed although Vinnie couldn’t be convinced and continued to check everyone else’s beaks and scratch through the dust in the run, just in case. He found a few bits here and there and vacuumed them up while the rest contentedly took part in a group Preening Party. He finally decided that there was no more and came over and whistled at me and cocked his head because I was still holding the bowl. I showed him the empty bowl through the fence and brought it close enough so that he could see inside and he pecked it through the wire and then wandered away to join the rest at the Preening Party. I watched them a while longer and since the Pasta Show was over, I finally went back up to the house. 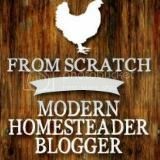 I shared this post on the Backyard Farming Connection Hop #82! Earlier this week, we’d just finished dinner and I was sitting on the sofa (probably being tortured by a Sasquatch program that Tom insists on watching). I glanced out at the chickens, who were in their run, scratching for invisible scratch and chasing invisible bugs. I think some of the leaves that fall into the run have hallucinogens in them. Anyway, everything appeared to fine and they were busily involved with their usual pre-Chicken Bedtime nonsense. In between making fun of whatever Tom was watching and wanting to stab myself during locally produced commercials (you wouldn’t believe how bad the commercials are here…every used car dealer thinks his kids should do the commercials for the dealership…it drives me INSANE), I’d glance out at the run just to make sure the flock was still behaving and hadn’t tried to saw their way out of the run to get at a single piece of chickweed that was just out of their reach. Back to the chickens. They were standing together at the side of the run looking a bit tall and skinny which usually means that one of them has uttered “THE DANGER SOUND”. They do it all the time. They’re the chickens who cried wolf. One of them make that “BUH-BUCK!!! !” sound and the rest freeze in place with their necks so extended that they look like bowling pins with beaks. I always look around and never see anything, which brings me back to my suspicion that those leaves they’re eating from whatever tree that is could make me some money if I ever wanted to quit my job and become a drug lord. I looked around at the yard that I could see from my vantage point on the sofa and everything looked just peachy. I looked back at the run and if possible, I think those chickens were even taller and skinnier and more bowling pinnish. Then I noticed a flash of an orange tail and I realized that Wally, our elderly, n’er-do-well cat that lives in Tom’s shop (also known as our three car garage…which rarely sees a car because the place is jammed with theatre scenery), was probably out on one of his evening walk-abouts and despite being a cat, he really isn’t that interested in the chickens. Wally is terminally lazy and actually lays down to eat his cat food. Getting into the chicken run and chasing one of them down is NOT on his list of things to do. Lying on the floor eating cat food and knocking tools off tables are the only things on his list to do…and sleep. He’s a card carrying member of the Professional Cat Sleepers Guild. So I really wasn’t too worried. I watched a little more of the hillbillies screaming about Sasquatch (“IT’S A SQUATCH!! !”) and glanced out the window again. 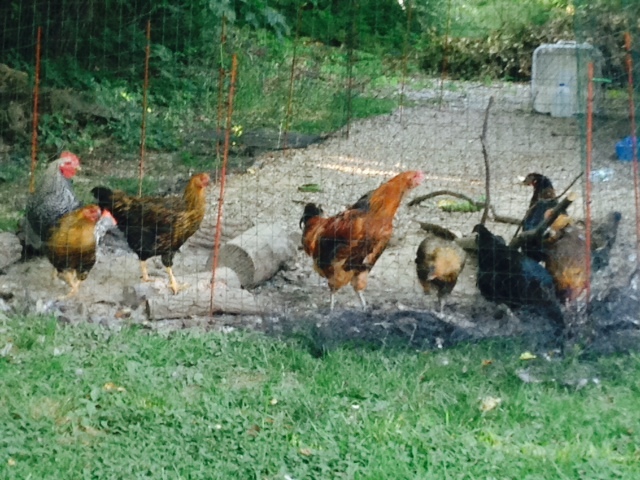 The chickens had gotten even taller and skinnier and were all standing together in a group watching something. I saw the flash of orange again. Damn that Wally. I’ve been trying to convince Tom for years that Wally needs to go live in another country and I’ve even offered to box him up and ship him somewhere…I’d even go so far as to poke holes in the box. He must be laying on the sidewalk in front of the run…either that or leaves were making the chickens have a really bad trip. Um. The flash looked bigger than Wally. I squinted so that I could see better. A tail was barely exposed from behind one of the boxwood bushes. It looked a bit…fluffy. I glanced at the chickens in the run and they appeared absolutely frozen in place and were staring. Then the visitor revealed itself. And thundered across the room, down the stairs to the foyer, through the two car garage, and down the path to the where the chickens were. I don’t think my feet ever touched the ground. As a general rule, I don’t move too fast. Our laundry room is on the entrance level of the house, and if I have to walk down the eight steps to the foyer to go to the laundry room, I have to think about it for an hour before I actually do it. When I realized that the visitor was a FOX, I moved faster than I move when someone says “Hey…there’s a chocolate cake in the kitchen”. When I got to the run, there was no sign of the fox. There are woods, a pond, an open field, it could have gone anywhere. The chickens were still standing there looking stunned, except for Vinnie who thought there might be a snack about to be dispersed. I checked around the pool, around the coop, and around the run. There was no sign that it had tried to get in. The chickens settled down and I threw them some scratch to keep them busy because Vin’s constant chortling for treats was getting to be a bit bothersome. Tom appeared on the path from the house and I ranted about foxes and coops and chickens and fence and foxes and chickens and foxes and chickens. He checked around a little bit and declared the area fox free…for the time being. We’ve known that there is a family of foxes living in the woods that border the side of our property. Occasionally, prior to the chickens moving in, we’d see the male and female come out of the woods and trot through our neighbor’s yard on their way to do fox business. Earlier this spring, we were out on the deck enjoying a warm evening and we heard the yips of the kits and the louder yaps of the adults echoing through the ravine that leads to the pond. They were very close. Another evening, I was outside picking weeds for the chickens near the edge of the woods and heard a noise. I looked into the woods and glimpsed a red/orange flash. I took a few steps closer and could see the fox kits playing on the other side of the ravine while one of the parents watched from a distance. 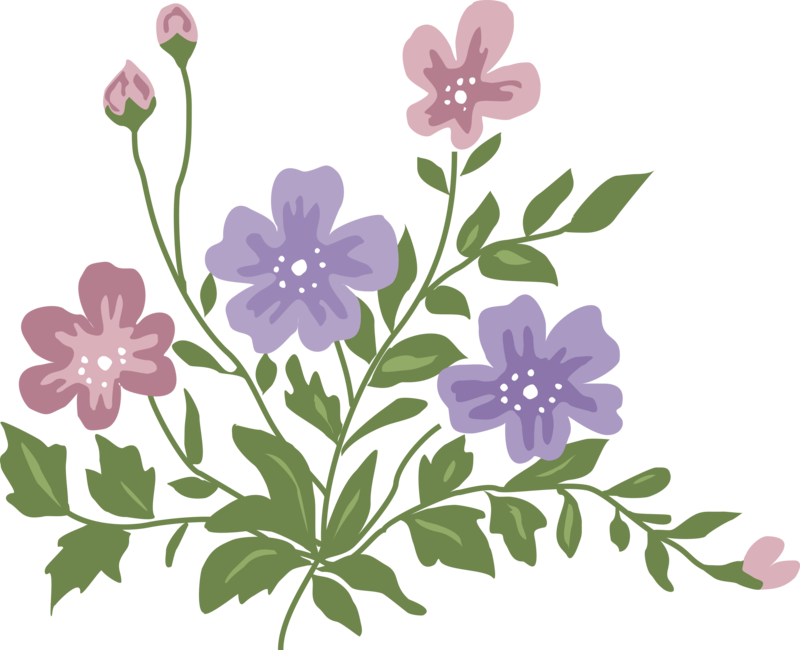 Greg had stumbled across their den when he was searching the woods for morel mushrooms and said that the area around it was littered with animal bones. They now obviously know about the chickens. I know that they’ll come back. I’ve checked the run over and over again to be sure that they’ve not started to dig a hole or push through the fencing. I don’t think they could, but I know that I’m also naïve about the ways of foxes and the stories that I’ve read from other chicken keepers about foxes taking members of their flock in broad daylight make me terrified for my own little flock of ten. So there’s good news and bad news. The good news is that the chickens remain unscathed and their coop is very secure. 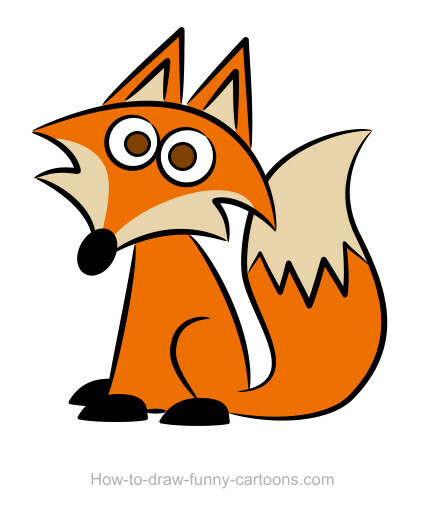 The bad news is…we’ve got hungry foxes in the area…and foxes love them some chicken. The bad news for the foxes is…I love me some chickens too and apparently I can run pretty fast when the situation calls for it. Don’t underestimate this soon-to-be 50 year old, foxes. I may be afraid of a quarter sized spider, but I am NOT afraid to make you into a fox stole…so see what you can do about that shabby fur. I want to look FABULOUS if I end up having to make you into a new wardrobe piece. If you follow the world of poultry at all, you’ll know that the Centers for Disease Control (CDC) have recently issued an advisory statement regarding a particular hatchery’s chicks being infected with Salmonella. It’s been very difficult for those who have found that their chicks originated from that particular hatchery and emotions, fear and denial have been running fairly high at many of the popular internet chicken water coolers. 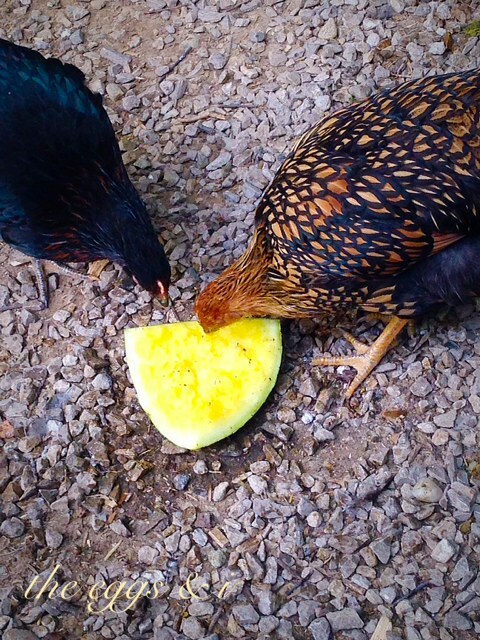 The backyard chicken movement across the country is exploding. People are understanding the value and joy of keeping a small flock of birds for their own use or perhaps to share eggs with the community that are local in origin and humanely obtained. With the spread of the popularity of backyard chickens, also comes a lot of new folks who not only aren’t knowledgeable about backyard chicken raising, but also do not have the knowledge to follow biological safety. It’s not their fault. They simply don’t know what they don’t know. In one of my previous positions, I was an infectious disease physician extender meaning that I rounded for the physician and saw his patients, evaluated their status and lab results and wrote progress notes that were later confirmed and signed off on by the attending doctor. During that time, I learned quite a bit about infectious disease, but I’m certainly not an expert and I’ll be honest about that right now. However, being in healthcare in general, you learn a tremendous amount about how disease is transmitted and what should be done to avoid that from happening. I thought I’d take a moment and list some friendly tips and some information about Salmonella. Salmonella is an equal opportunity bacterium. It would like to live in you and if it decides that you’re a cool place to hang out, you’ll know about it. Gut-wrenching abdominal cramps, unbelievable diarrhea and fever are the typical symptoms. Someone on another page that I was reading mentioned that it’s not that common and you might not even know you have it. 1.2 MILLION cases are reported every year. Some of those people do okay, some are hospitalized because they are so severely dehydrated, some have lasting effects like joint pain and other damage to their bodies and some, frankly, die. I assure you, you’ll know you have it and so will everyone else at your house and maybe everyone else in your area because you’ll be doubled over on the commode yelling about your abdominal pain while your body tries to purge every molecule of water from it through your backside. This isn’t one of those overnight stomach bugs. This is one of those fluid and electrolyte draining, dehydrating, miserable situations that at some point during which you’re sure you’re dying. Salmonella and Salmonellosis is not anything to take lightly. Prevention is the key when dealing with a bacterium like Salmonella. 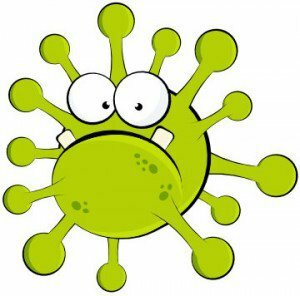 There is no cure other than supportive care and antibiotics are not always helpful because the darn bacterium keep figuring out ways to be resistant to the antibiotics that we’ve over used over the years. It’s not enough to say “well…it’s just diarrhea…it’s not going to kill you”, because it most certainly CAN kill a human especially if they are a child, elderly or immunosuppressed. In order to prevent something from occurring, you have to understand how it occurs. Salmonella bacteria live in the GI tracts of animals. Those animals aren’t necessarily sick, but they are carriers and at various times, shed the bacteria through their feces. Humans encounter that feces in a variety of ways, none of which you want to think about too terribly much, because you are, after all, eating poop in order to come in contact with the bacteria. It can also spread through dust and animal dander and if you’ve ever been around a chicken, you know that not only are they atomic poop machines but they also are dusty, dandery and well, lets just be honest…downright dirty. Without going into too many details about how the condition is spread…because I’ll start screaming…let’s move on with tips on how to minimize your risk for contracting and spreading Salmonellosis or as I like to call it…common sense. Every time you touch a chicken, touch anything in the coop, open the coop door, change water, add food to the feeder you’re at risk for picking up bacteria. I shouldn’t even have to tell you to wash your hands. Many people think a quick rinse under the kitchen sink is washing their hands. NO. Let me say that again…NO. When you utilize your kitchen sink to wash your grubby chicken poopy paws, you’re just introducing that bacteria into the area where you cook and wash dishes. STOP IT. Either keep hand sanitizer in your pocket to use on your way to the house (and you should do it before you touch that back door handle, by the way) OR keep antibacterial soap outside of the house near a water source and wash your hands before entering your home. When you wash your hands, you should do it long enough that you can sing the entire ABC song that you learned in kindergarten while you do it. Get under your nails with a scrub brush, do the backs of your hands and wrists because bacteria are sneaky. If you’ve only used hand sanitizer, you’ll still want to get under your nails and wash well with soap and water. Washing your hands is the number one single thing that you can do to protect yourself and your family. Make your children and your hubby or wife wash their hands often. You have no idea if they’ve been out petting chickens or giving them treats or maybe they found a hidden cache of eggs in the sandbox. You can not expect to stay healthy if you do not wash your hands. If you know your hands are contaminated by chickens…touch NOTHING in the house until you’ve washed your hands. You don’t want to be the one with chicken poop under your nails from cleaning up one of your girl’s dirty, poopy vents and then come into the house and answer the phone. Don’t take anything into the coop that you do not want contaminated. That includes your children and your dog that likes to eat chicken poop and then kiss you on the lips. Use bleach wipes to regularly disinfect the area around your sink and your door knobs on entrances and exits that are high traffic for your family. 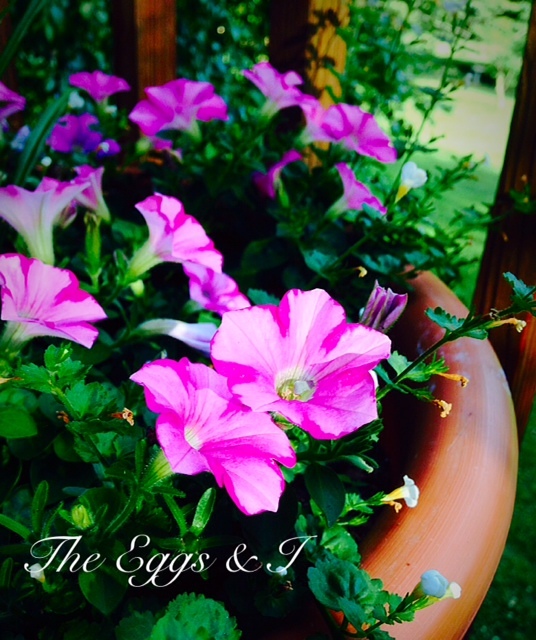 Using that rich chicken poop compost in your garden? Make SURE you’ve washed your hands and under your nails after you’ve worked in the garden and wash any food from the garden before you consume it. You’ll thank me later. For Pete’s sake, don’t wear your good shoes that you want to wear anyplace else into the chicken coop or anyplace else for that matter where the chickens are leaving precious chicken poop presents for you. I have three pairs of shoes/boots that are chicken coop only footwear. I don’t wear them into the house and I don’t wear them in public and it’s not because they’re ugly, it’s because I’ve been walking around in chicken bedding and they aren’t fussy about where they poop and when you’re chasing a chicken in the coop, you aren’t fussy about where you step. Get yourself some ugly shoes from the discount store and a pair of boots and make those your permanent coop shoes. Take them off before you go into the house and leave them in the garage on newspaper or on something that you can disinfect. 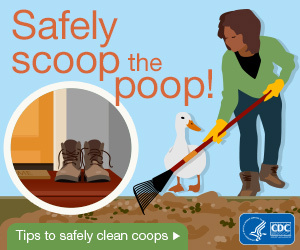 Tracking chicken poop all over your living quarters is inevitable if you wear your coop shoes into the house…and we all know what that means. Even though you don’t see it, it’s on the floor. Let’s say you set your purse or gym bag on the floor or your child’s back pack and then unthinking, you pick it up and put it on the counter or the table. The bottom of your purse and bags that you set down in public places are simply filthy. Hang them from the back of a chair instead of throwing them on the floor where someone (probably your kids) have walked and probably tracked in chicken poop that they stepped in outside. Educate your children. They don’t want to get sick either and it’s never too early to learn common sense sanitation practices. Cover up your clothes if you’re going to be working in close contact with your flock. An apron can save you from chicken poopy clothes and from dander and dust. They aren’t a perfect solution, but unless you like doing laundry and changing your clothes every time you come back to the house, they are helpful and will save you a ton of time in the laundry room. Wash them frequently in hot soapy water and you might want to just do a chicken clothes load of laundry. Just a suggestion. Your family will give you grief about the apron and when they do tell them you’re doing it so they don’t get flaming diarrhea and leave it at that. “YOU CAN JUST THANK THIS APRON FOR NOT HAVING FLAMING DIARRHEA” and then spin on your heel and leave the room. That usually gets them. As much as I love my chickens, and I really do love them, they are NOT allowed in the house. They never were kept in the house and I would no more consider allowing them to live in the house at any age, than I would consider living in their house. Chickens are carriers for many things that make humans sick. They don’t belong in your living environment. They are animals and they aren’t clean animals. They are indiscriminate poopers and they belong in an environment where they can indiscriminately poop. You can argue with me until you’re blue…chickens need to be outside or outside of your living area anyway, from the DAY you bring them home or they hatch. They are not clean animals. You will get sick in some form or another and your feathered room mates will probably be somehow involved with that. Trust me…you don’t want to hear my “I Told You So” song…because it also comes with a dance. Really? Do I have to tell you that? Come on…they sleep in their own poop…they walk in their own poop and then they scratch their face with their scaly poopy foot. Do I really need to tell you not to kiss them on their darling cheek? Alright. 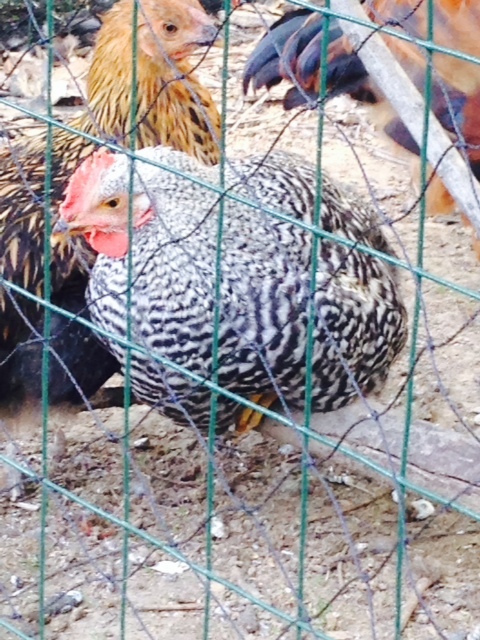 Your kids are cute, the chickens are cute…look how cute they are together….AWWWWW. Little Susan likes to kiss the chickens and play with them outside…and oh look…she’s eating a cookie. Do you see where I’m going with this? Children should be taught proper hand washing so that they know every time they’ve touched the chickens or been outside that they should wash their hands. They probably have learned about singing the ABC’s while they wash their hands at school. Ask them…they’ll teach you. And make them leave their shoes in the garage! If they’ve been running around where your chickens free range, those shoes are most likely stomping on poop while they’re outside. Common sense stuff. Shoes….in the garage…clothes…changed when you come in…hands….WASHED before you do ANYTHING else. Those should be the rules for children in your home. And tell them to leave the chickens alone if they don’t understand. Kids are not nearly as cute when they are spewing poop and crying from stomach pain or lying in a hospital bed. I’m glad that I have chickens, but I’ve been vigilant about germs from the first moment we set eyes on them at the farm store. I just hate stomach ailments. I’d rather chew tinfoil than throw-up or have nausea. Being an RN, I’m a bit of a freak about it, but I’ve just given you some easy things that you can do to minimize your risk for illness. If you purchased your chicks from this hatchery with the Salmonella contamination, I would recommend that you contact your local farm extension office for advice regarding their future with you. I don’t want to sound callous, because I would be devastated if it were my birds, but if yours test positive for Salmonella you are endangering not only yourself and your own family, but you’re endangering any human who might come in contact with you, your flock, and your eggs. The Centers for Disease Control have a great website that can educate you about preventing disease. I was also on the The Chicken Whisperer’s page today and he’s been doing radio shows with scholars and veterinarians and I understand that tomorrow the hatchery owner of the place with contamination may be joining the show as well as someone from chain of farm stores that sold chicks from this hatchery. You can find information here about The Chicken Whisperer’s live radio program. Just use common sense. Stay healthy. And for Pete’s sake go wash your hands. Chris Thompson is a registered nurse, part time writer, sometimes actress, occasional photographer, intrepid artist and amateur neurosurgeon. She specializes in unfinished art projects and stacking unopened mail on countertops. 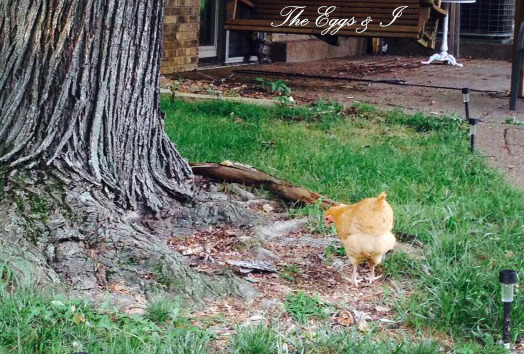 Recently, Chris has chosen to begin an adventure in her own backyard that involves chickens and gardening. Friends are skeptical and family is concerned, but she remains resolutely focused on growing food and chickens in a subdivision….hopefully without ticking off the neighbors. Be safe when caring for your chickens! This book is wonderful! Click on the image for more info! Natural chicken keeping at its best! Love chickens? Check out some of my favorite blogs! I LOVE diatomaceous earth. Great for the coop!! I use this. IT’S MOVING DAY! 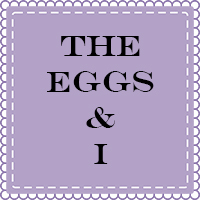 New Blog Home!! New chickens! Vinnie isn’t happy.